If you think that you're a stickler for grammar, consider the position of the British regarding the 1871 Treaty of Washington. According to a literary historian, the British government refused to sign a treaty with the Americans if the treaty contained a single split infinitive. There was one point, we are told, upon which the home Government was sternly inflexible. "For it," says Mr. Lang, "much may by literary persons be forgiven them." It telegraphed that in the wording of the treaty it would under no circumstances endure the insertion of an adverb between the preposition to (the sign of the infinitive) and the verb. Mr. Lang feels justly the heroic nature of the act. Much might be yielded on questions in dispute which all knew would ultimately involve the expenditure of money, and indeed implied at the time admission of previous wrong-doing; much might be yielded in the case of certain things which the biographer himself seems to regard as points of honor. Still, on these minor matters it was thought advisable to give way. So much the more must our tribute of admiration be paid to the English Government for remaining as immovable as the solid rock when it came face to face with the great question of severing the close tie that binds to infinitive the preposition to. "The purity of the language," observes Mr. Lang, "they nobly and courageously defended." So the next time you think about sticking a word between the "to" and the verb in an infinitive verb form, consider that political negotiations have been held up over something so small. 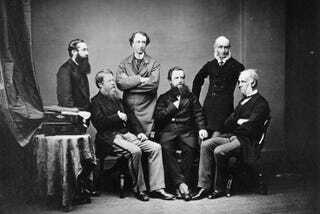 Top image: The British High Commissioners for the Treaty of Washington. Norcote is seated at the left. Via Wikimedia Commons.